Looking for a brunch spot after a busy morning of inspections? 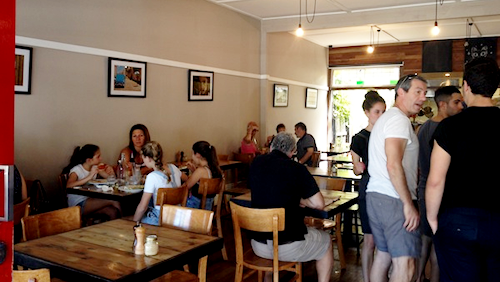 This week Street News writer Jessica Hoadley was on a pancake quest, leading her to Crowded House Cafe in Williamstown. Hipster has arrived in Williamstown, and it’s brought smashed avocado with it. Actually, the cafe has been open since 2011 and it’s quite the establishment: often as busy as its name suggests. Luckily on this sunny Sunday morning it’s not too packed, as I’ve dragged a friend recovering from a buck’s party all the way to Williamstown in search of breakfast, and he’s hungry. We’re seated straight away on the street out the front, and he says he wants pancakes. Lots of pancakes. I choose the smashed avocado with Meredith goat’s cheese on toast with a poached egg and macadamia lime dukkah. Mmm. Practically drooling. 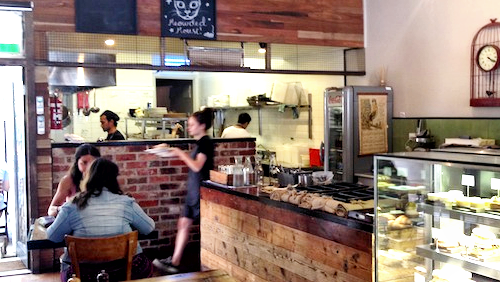 Crowded House has a large and airy interior, fitted out with timber plank tables, exposed brickwork and rustic birdcage decorations; hence the hipster vibe. Out the back there is a lovely rear courtyard with shady trees. It’s super popular on days like today with the smell of summer in the air. I do generally rate a cafe on the quality of its smashed av. So many places do it wrong, with giant slices of wet tomato on top or too many herbs or not enough fetta, but I can say Crowded House does it right. The avocado is piled up high, the egg nicely poached, and the dukkah (a crumbly sprinkling on top) adds a nice tang and texture. It was served with two bits of toast, which I reckon needed a second egg or a bit more avo as it only really covered the top piece, but otherwise thumbs up. 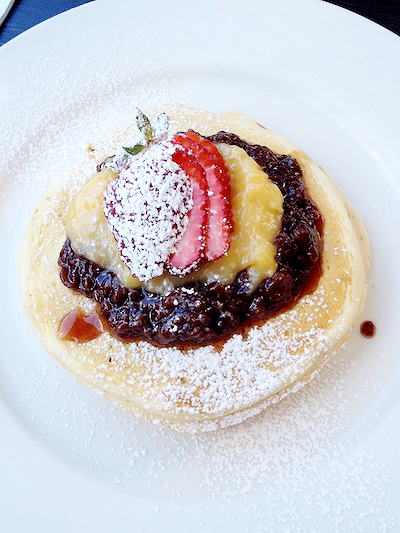 The buttermilk pancakes were served with house made raspberry jam and lemon curd, both of which packed a flavour punch. There was no sickly sweet syrup or supermarket jelly jam in sight. The raspberry and lemon flavours were fresh and intense, and the pancakes themselves soft and not dry like pancake stacks sometimes are. There were lots of other yummy looking items on the menu too, like zucchini and corn fritters, baked eggs in a tomato, eggplant and capsicum braise, and spiced smashed pumpkin on toast… I wonder if smashed pumpkin will become a thing? I better come back to check it out.